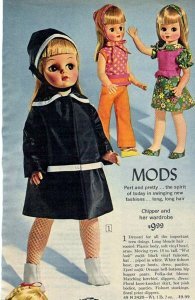 Deluxe Reading-Topper’s Dawn family of dolls wore a wide range of Mod outfits. 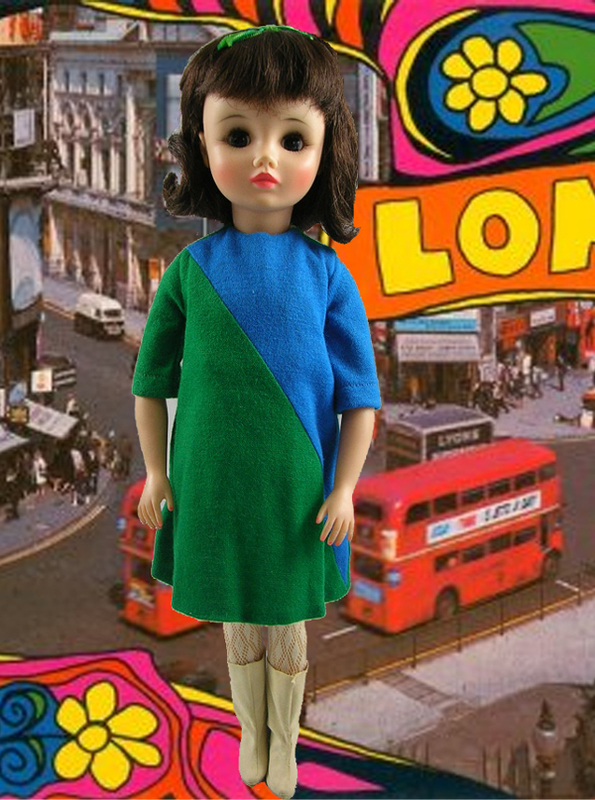 The names Mary Quant, Piet Mondrian, Richard Avedon and Yves St Laurent may not at first seem to go with names like Barbie, Francie, Miss GoGo, and Giggles, but they all came together in some of the most fun fashions and dolls of the 1960s and early 70s. In 1960s London young working-class people fed up with the austerity of the post WWII era shortages and the fashion conventions of their parent’s generation were primed to break away to new means of expression. Designers like Mary Quant, feeling this same need for change, lit a match that still burns today. Inspired by art and music, designers redefined the fashion silhouette yet again and produced clothes that would be more affordable to the masses. The popularity of this new trend was not lost on the doll manufacturers of the day who were quick to bring the Mod look to their doll lines. 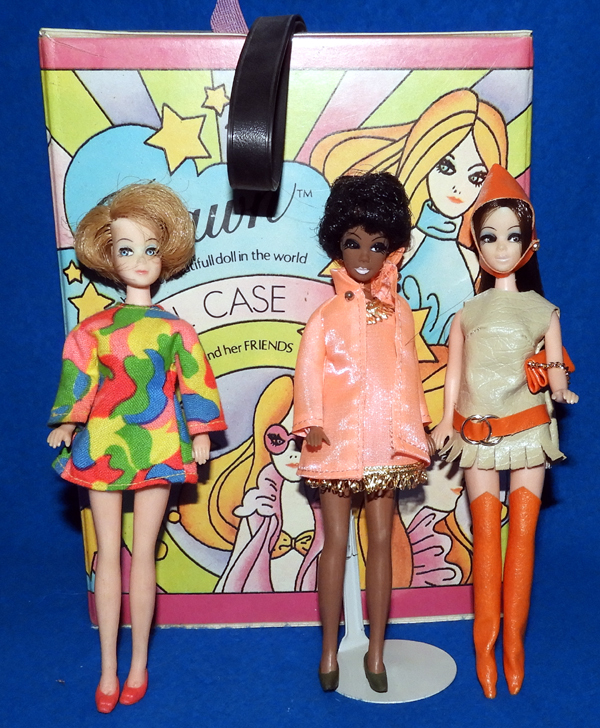 Chief among these mod inspired doll fashions was that style maven – Barbie®. Mattel entered the mod scene introducing new friends and relatives to the Barbie family. Dolls like Francie and Casey sported looks that transported little girls and boys right to Carnaby Street. 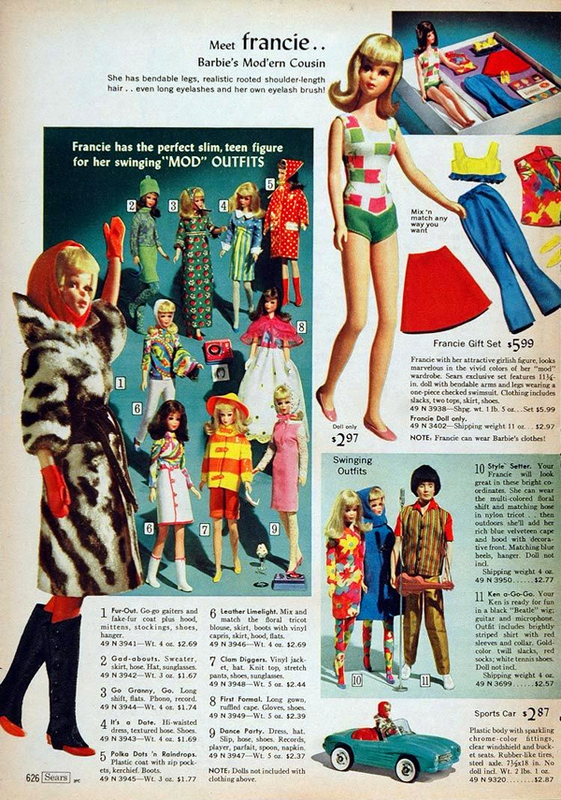 Mattel’s Francie doll introduced in 1966 was touted as being Barbie’s “Mod-ern Cousin.” Her slighter figure was ideal for the slim, straight lines of the new fashions. Barbie and Ken also had fashions for the new era, notice the mod outfit including “Beatles” inspired wig on Ken pictured in this ad! When fashion designer Yves St Laurent looked to the paintings of Piet Mondrian for his color-blocked dress styles he created one of the most iconic looks of the era. Well established doll companies including Madam Alexander and Vogue Doll Company began to include similar looks into their lines. 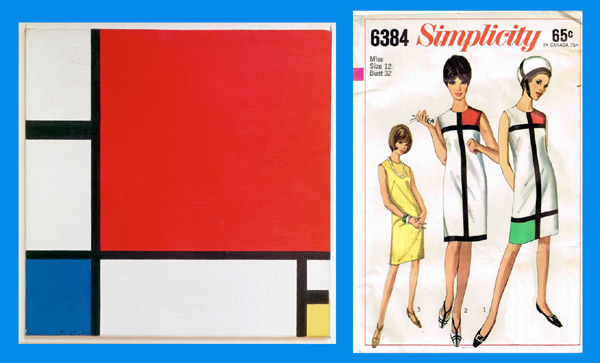 Paintings such as this work, Composition II in Red, Blue, and Yellow, by artist Piet Mondrian inspired Yves St Laurent’s immensely popular dress designs, patterns were available for the home seamstress from both the Vogue and Simplicity pattern companies. Even the smaller companies such as Skippy Doll Corp. sold mod-look products. Their 19″ Miss Go-Go is a veritable time capsule of her day, complete with white go-go boots. Madame Alexander looked not only to the world of fashion to remain current with her doll designs but also tied into pop culture on television. Her Marlo Thomas doll portrayed Thomas’ “That Girl” character. 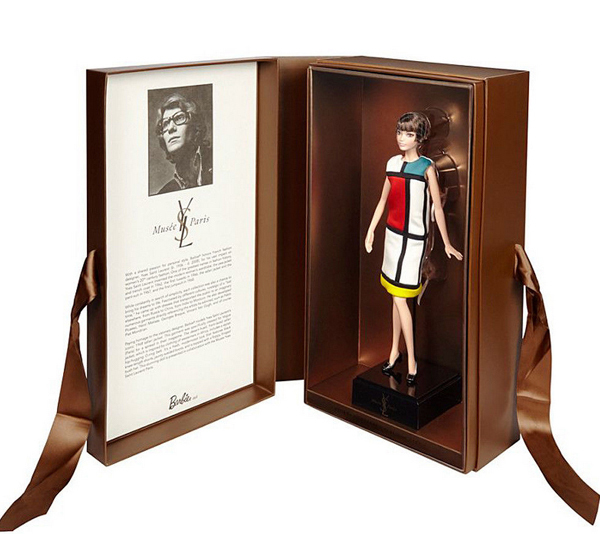 The style became so synonymous with the mod era that it is still popular with doll collectors today. This Barbie® is from the 2018 Platinum Label Barbie line. The model Lesley Hornby, known to the world as Twiggy, personified the style of the era. This Vogue July 1967 magazine cover image shows her wearing Mary Quant’s creation, the image was shot by Richard Avedon. 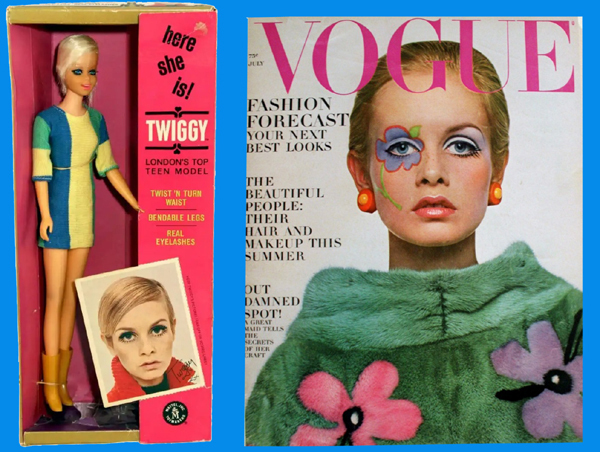 Mattel’s Twist N’Turn Twiggy doll also hit store shelves in 1967. 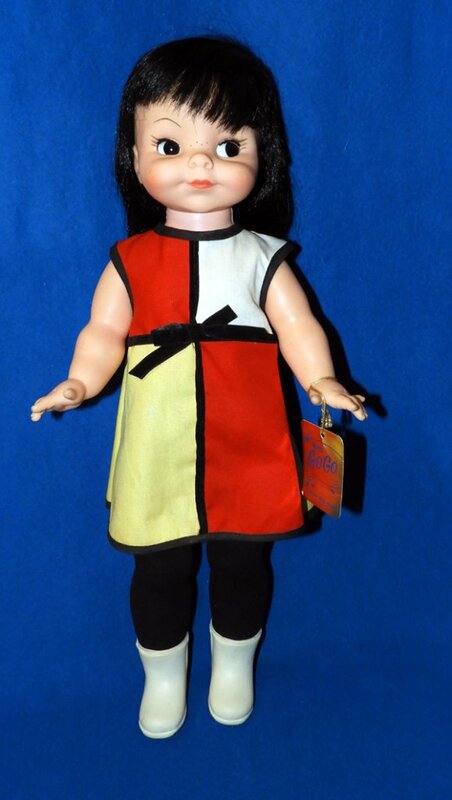 Effanbee released a line of dolls named Chipper in 1966. This ad shows them in mod outfits. Mod styles, led to flower-power and psychedelic art and fashion and toy companies such as Effanbee, Remco, and Hasbro came out with dolls sporting the newest looks. Images by artists like Margaret Keane began to appear on everything from prints, to greeting cards, to figurines. Dolls like Suzie Sad Eyes by S. Rosenberg Co. capitalized on the popularity of this look. 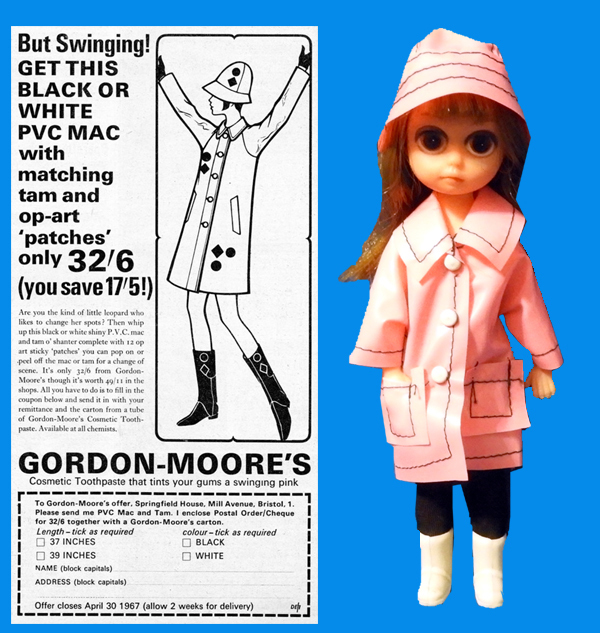 The mod plastic raincoat look of the late 60s combined with the art of Margaret Keane inspired a sub group of dolls in bright, shiny slickers. This doll is Susie Slicker by Fun World Creations, NYC. 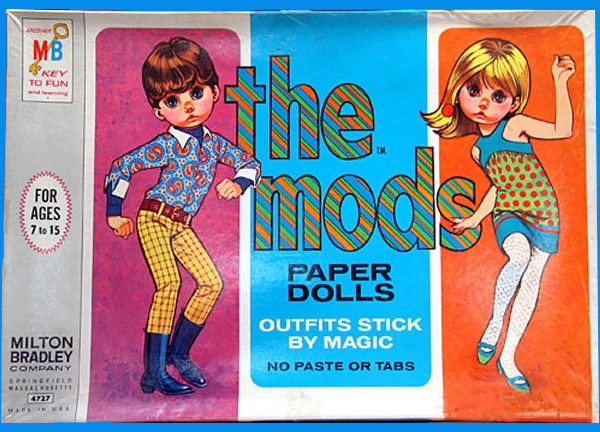 Milton Bradley had a whole line of toys and puzzles called “the Mods” which included this 1967 paper doll set. Today the mod looks of the past are considered retro and are again influencing current fashion design while the mod dolls of the late 1960s and 70s appeal to collectors who relate to them on a nostalgic basis and to younger generations of collectors who relate to the sense of fun and freedom of these looks. 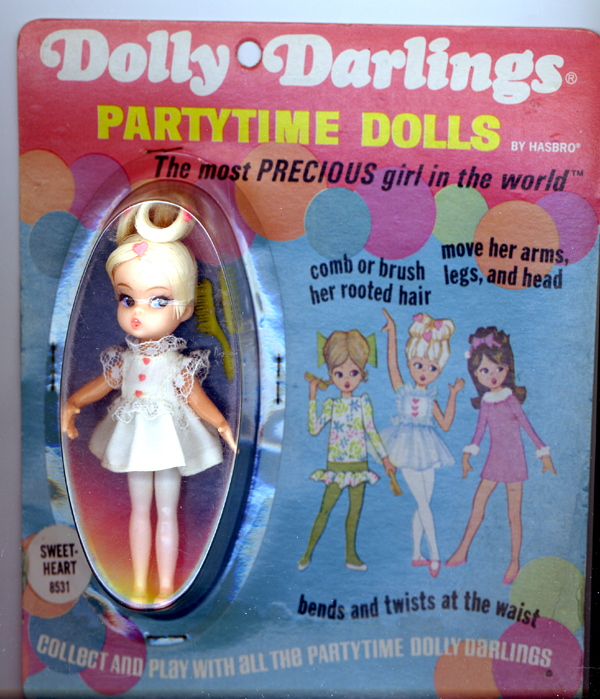 Hasbro’s 4.5″ Dolly Darlings were part of the late 1960s trend for miniature dolls. These dolls introduced in 1965 and are equally popular today with collectors who remember them from childhood and those who have recently discovered them.